Just in time for Memorial Day, this month’s theme for World on a Plate is grilling! I don’t have a backyard, or a grill, but I do have a cast iron pan, which can be a worthy substitute. Since I’m representing America, I immediately knew that I would be bringing burgers to the party. 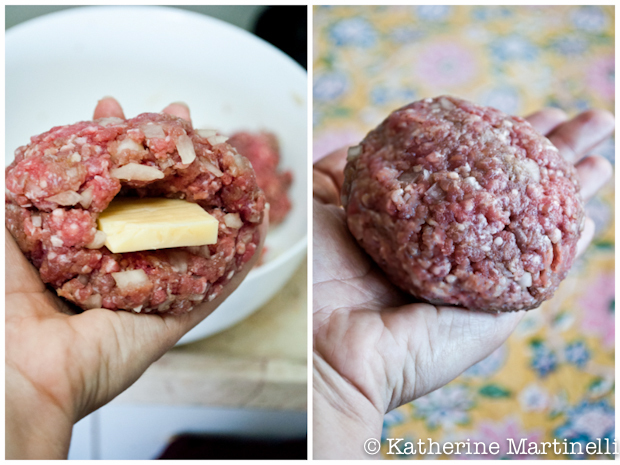 But I didn’t want to go with just any old burger – so I stuffed some cheese inside to make them extra special. 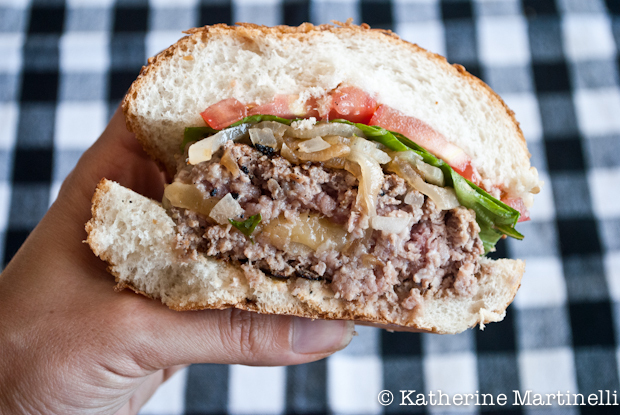 That’s right: a cheese-stuffed burger. When you cook the burger, the cheese inside melts, creating an ooey-gooey surprise that any cheeseburger-loving person is bound to go nuts over. You can even go extreme and put more cheese on top, but that’s just crazy talk (which I fully support). Although hamburgers are an iconic American food, they can be traced to Germany – to a little place called Hamburg, in fact. According to What’s Cooking America, the original Hamburg Steak was salt beef, and bore “little resemblance to the hamburger we know today.” German immigrants brought this dish with them to America, shredding the tough, inexpensive beef and forming it into patties. And those are the humble origins of the hamburger! Stuffing a burger with cheese is easy as can be. Simple form the meat into a patty as you would for a normal hamburger, then stuff a square of cheese inside and smooth the meat over. If it’s sealed in then the cheese won’t melt out during cooking. You can cook them on the stovetop or, as I did, in a cast-iron skillet over high heat on the stove. 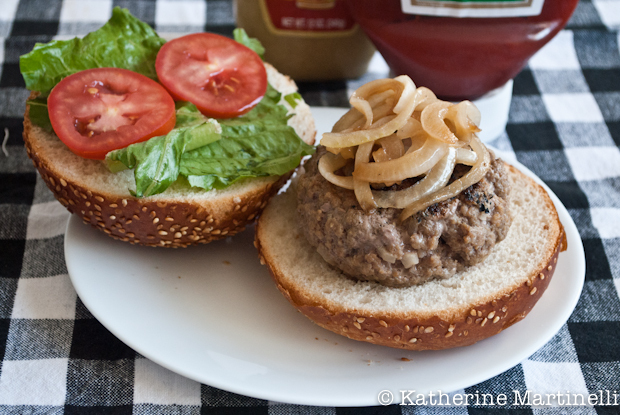 For another excellent burger recipe and some great tips on grilling check out this post over at Kitchen Riffs. Wondering about World on a Plate? 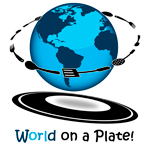 World on a plate is a blogging cultural exchange. On the last Sunday of the month, bloggers from all over the world get together to interpret a food through the lens of their home country cooking. Each blogger will produce a wonderful dish featuring the food chosen that is typical of her/his home country and will tell us a bit about the dish. If you like cheeseburgers, then you'll love these cheese-stuffed burgers. Top them with caramelized onions, lettuce, tomatoes, and - why not?! - more cheese. In a large bowl mix together the ground beef, onion, garlic powder, and worcestershire sauce until just combined (do not over-mix). Form into four equal-sized patties (this will make four quarter-pounders - feel free to make them smaller as well). Take one piece of cheese and stuff it in the center of one patty. Smooth the meat over the cheese to fully seal it in. Heat a cast iron skillet or grill plate over medium-high heat (or heat the grill). Coat lightly with oil. Add the burgers, working in batches if necessary, and cook until seared on both sides and cooked through to your liking, about 5 minutes per side (often the second side only needs about 3 minutes). Remove from the pan and put on buns. Top with lettuce, tomato, caramelized onions, or your favorite toppings. Serve immediately. What a great burger! I always spike mine with worcestershire sauce too. Love the caramelized onions! Wow! You just went and made a burger even better with that cheese! I am having a bbq this weekend and I think i am going to give these a try! Even I add little worcestershire sauce to my patties. I started to use it for the meatloaves I made while following South beach diet and now its my kitchen staple. That sauce was very new to me then. I love to hide cheese inside my patty and when people bite it they are surprised with a different flavour. Your patty looks so juicy, I could see it from the picture itself and I am very sure that everyone must have enjoyed its texture and taste. Having these at my next bbq! These burgers with the hidden cheese in them are really very juicy and tasty! Great choice Katherine! That’s one good looking burger! Specially that cheese on the middle, I remember when I started cooking I have the habit of stuffing cheese on almost everything from grilled pork to burgers like this. My dad always made these for us growing up – if you really want to make it a tasty but heart attack inducing burger, split a frank in half, but leave the casing on one side intact (like a hot dog bun) grill it, and stick it on top of the burger. That’s a great burger that make us all crave for one! I often stuff cheese too, but not for American style humburger. I should definitely make one just like this! The idea of sealing the cheese inside the burger is awesome! I like that much better than putting it on top also the caramelized onions are a must. You are definitely putting me in the mood to grill some burgers! Enjoy the day. This just screams, “Welcome to summer!! !” to me! These look amazing. I can’t wait to try these at home! Happy Memorial day 🙂 Love the caramelized onions! Burgers are the best way to celebrate Memorial Day. I love grilling and have been doing a lot lately. Great burger! wow! This is so Minnesota!! What a great american dish! Is topping it with bacon also crazy talk? YUM! never thought of this but what a great idea! Damn girl, this is one amazing burger. My guys would go loopy for this one. Love! Woo hoo….give me a big ole burger stuffed with cheese! That looks fantastic. I mean amazingly so. My Hubby would go nuts over this burger! Amazing! Oh I’d really like this for dinner tonight! They sounds super scrumptious! Wow, thanks for the link love! Really appreciate it. And this recipe? It’s great! I’m usually a melt-the-cheese-on-top type, but I love burgers made this way too. Kind of Burgers Kiev? No? Well, maybe not. 😉 Fun post – thanks. What a tasty burger! YUM! The photo’s made me drool. That burger looks extra juicy with the cheese inside. Now I want to grill burgers at home, with cheese inside, of course.